This outcome is highly irresponsible and could lead to adverse economic consequences, especially in the event of a major war, terrorist attack, natural disaster (such as a pandemic) or weather/climate-change-related event. In addition, over the long run, excessive deficits and debt are a tax and dangerous burden on our children and grandchildren during a period in which fewer workers will be subsidizing a growing number of senior citizens. What follows is Part 1 of a series of pieces on the Republican tax legislation’s health care components. This piece deals with the federal budget deficit, national debt, and projected health spending. Part 2 will discuss the proposed elimination of the individual mandate to purchase insurance under the ACA—if that proposal remains in the proposed legislation. As of this writing, it’s in the Senate tax bill but not the House bill. The White House and Republicans have sent mixed signals on the fate of the mandate over the past two weeks. 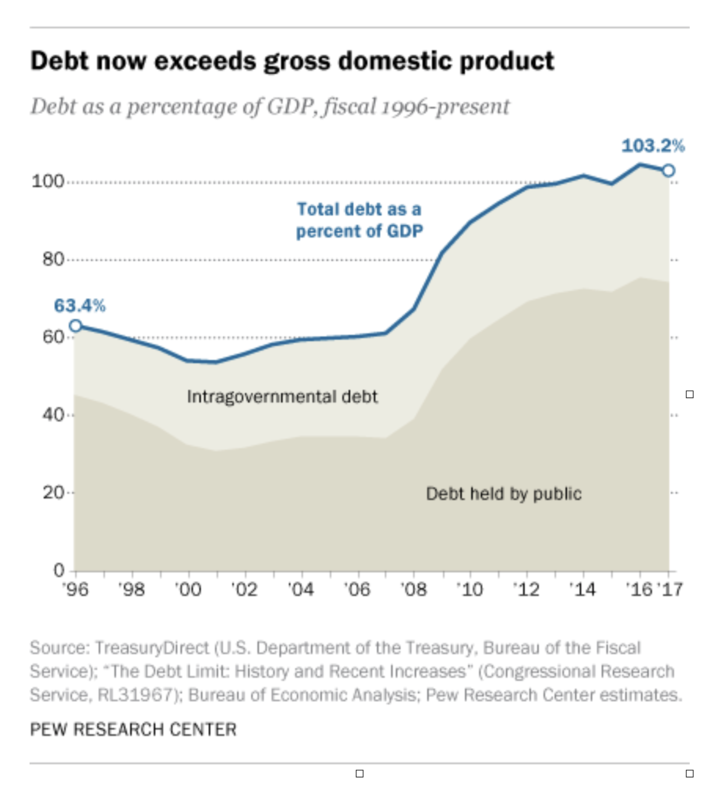 As has been widely reported, the tax legislation would add an estimated $1.5 trillion to the national debt over the next decade (some analyses show it closer to $2.2 trillion). Republicans dismiss this as a trivial amount and say economic growth, spurred primarily by the corporate tax cut, will more than make up for it. Many independent and Democratic-affiliated analysts disagree. They argue that (1) there’s no proof the corporate tax cut will add more than a fraction (less than 1%) to economic growth over the next decade, and (2) that an increase in deficit spending, and thus the national debt, at this point is greatly at odds with the current debt load, national priorities, overall projected government expenditures, and the government’s commitments to provide health insurance and care to upwards of 120 million Americans. The national debt is currently $20 trillion. That’s more than triple the debt in 2000, when it was $6 trillion. Federal government spending (our tax dollars!) to pay the interest on that debt varies from year to year. It mostly trends between 5 and 10 percent of the federal budget each year. In 2017 it was 6.5 percent. In 2018 it will be 8 percent—$315 billion of a $4 trillion federal budget. For a host of reasons, interest on the national debt is projected to be the fastest growing federal expense over the next decade. It’s projected to rise every year over the next decade to $787 billion by 2026 and in that year comprise 12.2 percent of the federal budget. Economists track the national debt in another way, too: as a percentage of overall GDP. That’s considered a more robust and meaningful measure for technical reasons. The table below indicates what many observers believe is a very precarious situation: our nation’s debt is now at around 100 percent of GDP. The GDP was $19.4 trillion in 2017. The only other time it was that high was during and right after World War II. And deficits and the debt are poised to rise further. If current tax receipts and federal expenditures, including for health care, were to continue at a pace equal to the past few years (often referred to as the baseline), CBO forecasts a federal budget deficit of close to $1 trillion in 2024. As is well known by health policy folks, Medicare and Medicaid account for bulk of health spending by the federal government (again, our tax dollars). And there’s no let up in sight. As most recently projected by CMS’s Office of the Actuary, Medicare spending will increase between 7.1 and 7.6 percent annually from 2019 to 2025. That program alone will make up 18.8 percent of the federal budget in 2019 rising to 21.4 percent in 2025. Medicaid spending is projected to increase around 6 percent a year between 2019 and 2025, and make up 9.2 percent of federal government spending in 2019 and 9.5 percent in 2025. Other tax-supported health care spending is also forecast to rise, including for the VA and active military, CHIP, tax dollars devoted to federal employees’ health insurance, and subsidies/tax credits for people who enroll in the ACA exchanges. CBO issued a report in September taking stock of several of these avenues of expenditures over the next decade—again, as a baseline assessment not factoring in any change in law. The tax exclusion for employer-based coverage (which, by the way, is among the largest tax breaks in the current tax code) will “cost” the government $297 billion in 2018, rising to $475 billion in 2027. Cumulative cost 2018-2027: $3.8 trillion. As an aside, the idea of limiting this exclusion has been debated for years since it is regressive; it benefits upper-income people far more than lower-income because upper-income people have, on average, richer benefits. It benefits people who buy coverage on their own and the uninsured not at all. A cap on the exclusion at a certain actuarial level could save between $50 and $100 billion a year. But that is politically unlikely to happen for the foreseeable future. Tax credits for those who purchase coverage in the ACA exchanges will cost the government $41 billion in 2018, rising to $62 billion in 2027. Cumulative cost 2018-2027: $531 billion. There are other commitments and costs as well, such as for CHIP (cumulative 2018-2027 spending: $64 billion) and the cost-sharing reduction payments (cumulative over the next decade: $99 billion, if those payments get restored in Congress as expected). All totaled, the tax benefits in existing law plus commitments and expenditures under the ACA for added coverage for the non-Medicare population add up to $654 billion in 2018. That is forecast to rise to just over $1 trillion in 2027. The cumulative cost 2018 to 2027: $8.2 trillion. And don’t forget: 30 million Americans under age 65 are expected to remain uninsured each year over the next decade. If we choose as a society to extend coverage further—via Medicaid, the ACA exchanges or new programs—where does the money come from? The U.S. spends a whooping amount on health care—across the board. Its’ commitments in this area of the economy are huge. Health spending is forecast to rise at a rapid clip over the next decade. Without substantial changes in the way we pay for health care that leads to a reduction in the rate of increase, rising expenditures are unavoidable and become unsustainable if other societal needs are to be met. Tax cuts and reforms that add to deficit spending and seek to reduce health care spending growth by (a) slashing budgets, (b) eliminating coverage or benefits and/or (c) shifting costs to consumers—without making major structural changes in the way we pay for care and how much we pay—are a dereliction of fiduciary duty. In this context, the Republican tax bills and the Trump administration’s 2018 budget are bad law and bad policy and should be rejected.